It’s easy to get stuck with a very limited set of cultural experiences. Our time and our money is valuable to us and so we often gravitate towards phenomena we’ve already experienced and enjoyed. Aware of this tendency within myself, I sometimes choose productions that are, on the surface at least, outside my established interests. The Riser Project’s Oraltorio: a Theatrical MixTape, currently playing at The Theatre Centre, was a leap for me…and one I’m very glad I took! We open on two young black women crouched intensely over boomboxes, cassettes and vinyl records piled up like the scattered remains of a feverish search. As they scan through radio stations, fragments of popular music can be heard through the static and I realized this is a search. When I recognized the chords of a favourite song, I was then immediately disappointed by how quickly it was dismissed and snatched away by static. But this isn’t about me and my experience of the music I identify with. 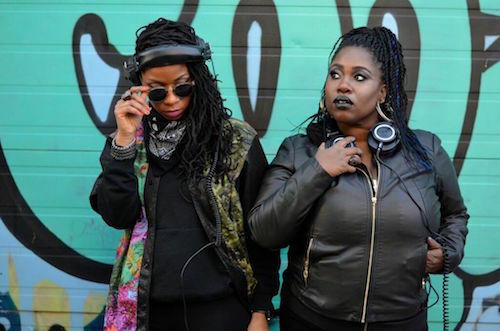 These woman are searching through the noise to find some musical thread to grasp that can lead them through their own shared history and help them forge an identity. And the purpose, I discovered, was to share the experience with me. The framing device here is their discovery of this “Oraltorio” on the airwaves. Our two listeners suddenly become possessed by the personas of B Girl and DJ as they journey through their shared cultural history. DJ L’Oqenz provides the rhythmic soundscapes that accompany Motion’s spoken word riffs on a multitude of topics all thematically linked to concepts of race, gender and identity. I couldn’t follow all of the text (the delivery is so quick and frequently overpowered by the beats), but key phrases jump out here and there and Motion’s evocative body language conveys all. With the sound mixed live and the frequent use of projections, this piece is technically complex, but the execution is so seamless that everything feels immediate and organic. It’s actually quite amazing just how smoothly it all flows. This feels so off-the-cuff and yet director Mumbi Tindyebwa has crafted perfectly realized moments where body, voice, soundscape and background imagery align with masterful precision. The energy, which shifts dramatically from moment to moment, never falters. L’Oqenz and Motion create an enticing vibe that invites you to participate in this musical journey. I couldn’t help but tap my feet and sway to the rhythms. Oraltorio is as insightful as it is magical. Go on, treat yourself!